Austin, TX (June 22, 2017) – B.O.M. Brewery, which stands for “Belgian Original Maltbakery”, is one of the world’s only brewing and malt roasting companies. It is preparing for U.S. brewing operations to begin this fall at the newly-opened Celis Brewery located in Austin, Texas, of which B.O.M. founder Bert van Hecke oversaw the design and construction. Over the years, van Hecke perfected his craftsmanship while working with industry leaders such as Orval and Rodenbach. B.O.M. 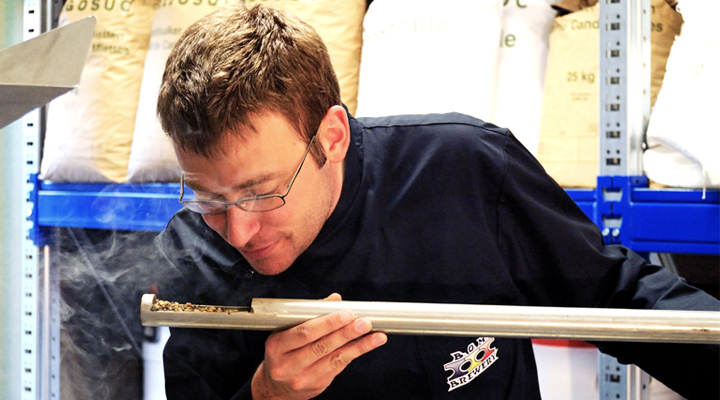 was born from van Hecke’s desire to produce extremely flavorful and fresh beer by uniquely hand-roasting his own malts. Now, here in the states, the newly opened Celis Brewery will contract brew for B.O.M. with its state-of-the-art 50 HL Braukon brewing system and 50,000 bbl capacity while Van Hecke supplies B.O.M.’s specialty malts from Belgium. For B.O.M., producing in the U.S. will eliminate international transportation costs and allow van Hecke to tailor his beers for the American palate. It may also call for packaging certain B.O.M. products in cans rather than bottles. “Bert is an extremely knowledgeable and talented brewer with an incredible mind,” said Bob Leggett, CEO of Artisanal Imports. “He has a keen ability to figure out what is most efficient.” Efficiency was a key factor in van Hecke’s decision to brew stateside. Heaven – A thoroughly hopped and dry hopped ale, loosely categorized as a Blonde. B.O.M.’s first brew – this alluringly cloudy ale beckons with a fruity aroma and smooth, snappy flavor from traditional English hops and B.O.M. wheat malt, amongst others. Full Moon 12 – A self-described parody of another classic Belgian beer that may or may not have “12” in its title (the monks threatened legal action if the word “parody” was used on the label). Clocking in at a perfectly cellar-able 10.2% ABV, Full Moon 12 is brewed with a secret blend of freshly-roasted B.O.M. malts and aged on home-toasted, Belgian-grown oak sourced by van Hecke himself. Bling Bling Imperial King – This lavish, malty golden ale clocks in at 8.88 % ABV, and true to the name, uses malts roasted with 24-carat gold. Interested in selling B.O.M. beer at your restaurant, bar or retail store? Interested in becoming a distribution partner for B.O.M. Brewery? Please contact Lanny Hoff with interest. For interview opportunities with B.O.M. Brewery founder Bert van Hecke, or for more information about B.O.M. and its one-of-a-kind roasting and brewing packages, please contact Lanny Hoff at +1 (612) 245-5433 or by email at lanny.hoff@artisanalimports.com.